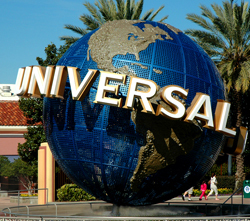 Universal Orlando consists of two theme parks: Universal Studios and Islands of Adventure. Universal Studios is dedicated to bringing those big screen movies to your feet in some of the most amazing and unique rides out there. Using themes from movies, films and TV shows this theme park is primarily your run of the mill off the big screen and into the palm of your hands kind of adventure! With a host of rides and attractions this theme park brings you an abundance of fun for each visit! rides like JAWS, where you meet the gigantic sea creature that reeks havoc face to face while cruising along in what was meant to be a peaceful tour of the harbor. Or take some basic training and join the ranks with the Men in Black as they keep the universe safe from alien invaders. Or take a pair of 4-D glasses and join the crew from Shrek inside their world, filled with dragons and villains in this fun filled adventure. Journey deep into a tomb in "Revenge of the Mummy," as you accidently awaken something dastardly. Venture into the heart of the storm and take on a Twister first hand, or laugh hard while riding the Simpsons Ride! Take a whirl on Universals newest attraction, the Hollywood Rip Ride and Rockit roller coaster. Soar 17 stories above the park at 65 MPH! Choose your music before you start and rock out to your tune as you take this wild ride to the limit! Universal Studios tickets are available as one day one park tickets or a multi day tickets with Islands of Adventure but the most economical way to purchase Universal Studios tickets is in an Orlando Flex.